BUT FOR OHIO STATE, STUDENTS WOULDN'T HAVE ACCESS TO ULTRA-INTENSE LASERS. Ohio State’s high energy density physics SCARLET Laser Lab in the College of Arts and Sciences is one of only a handful of such labs in the nation. These laser systems produce star-like conditions generating high-energy X-rays of intense brightness that easily penetrate high-density matter. 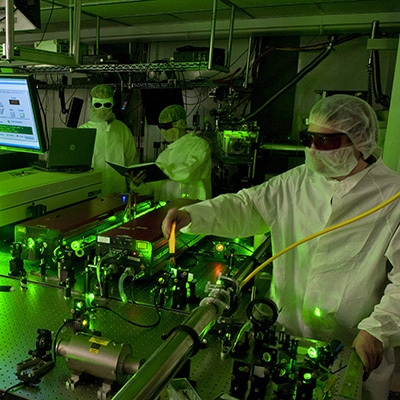 Most such laser facilities are located within national labs whose priorities revolve around national security. But Ohio State wanted to build a significant laser facility driven by scientific curiosity to educate and train students to be the next generation of laser scientists who will help advance breakthroughs in fusion energy, cancer therapy, as well as national security.